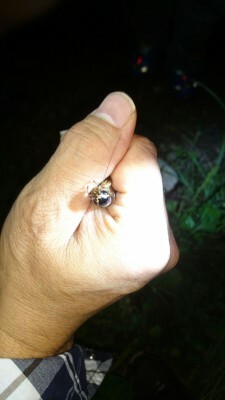 Traditionally the Japanese have savored autumn nights- not only for the refreshingly cool breezes which brIng relief to bodies and spirits worn down by weeks of relentless summer heat and humidity, but also for the chance to enjoy one of nature`s greatest natural choruses- that created by the chirping of Japan`s nocturnal musical-insects. 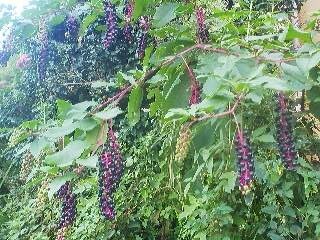 A KANTAN- one of Japan`s autumn-chirpers. 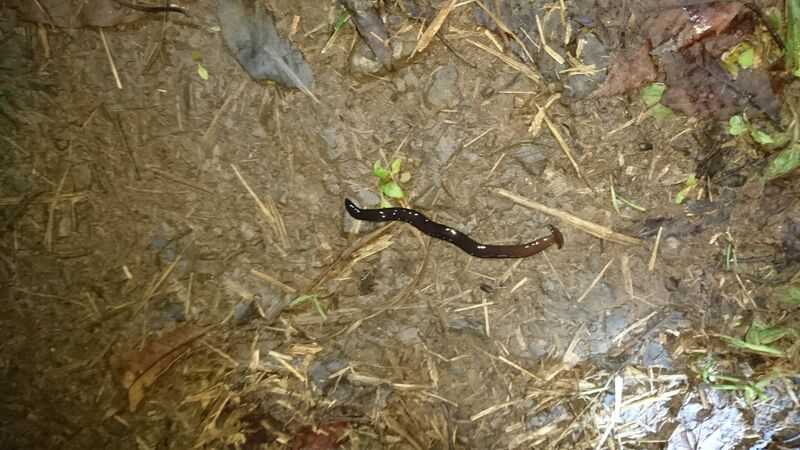 Hear them on our nocturnal walk in Konda, Tsukuba. In contemporary Japan, however, the amazingly complex and SUBLIME natural string symphony created by the insects goes almost completely overlooked (or overlistened! )- with windows shut, earplugs in, and stereos and televisions on. 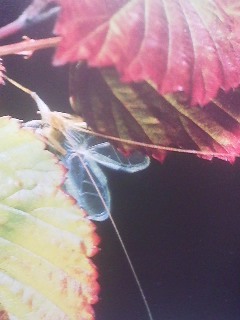 The same insects are still out there, though,and there still are those who appreciate them. One of these people in Dr. Masahiko Tokoro, an entomologist at the Forestry and Forest Products Research Institute (FFPRI) here in Tsukuba who can differentiate by ear the sounds of dozens of different insects. This autumn, Masa has offered to share his contagious love of Japan`s natural soundscapes with the anyone who would like to join him. We`ll be setting out on the evening on Saturday September 23rd. Anyone interested should be in front of the gymnasium at the former Sakura Branch Office (Sakura no Cho-sha) by 6:30 pm on at that date. Sorry for the short notice . Wear clothing that will protect you from mosquitos and other pests (insect repellent might be useful, as well) and bring a flashlight (though you do not absolutely need one). Children are welcome- though it will be best to be as quiet as possible on the walk. Besides the sounds of insects we might see some owls and small mammals. Unfortunately, we will not be able to see one of Japan`s most spectacular flowers- the night blooming KARASU URI no HANA (which we enjoyed last month. 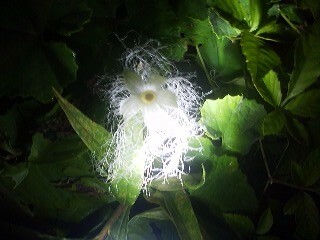 We will, however, be able to see the orange gourd-like fruits which appear on their vines when the flowers fall away. You are invited to a guided night walk focusing on the natural soundscapes of Japanese autumn. 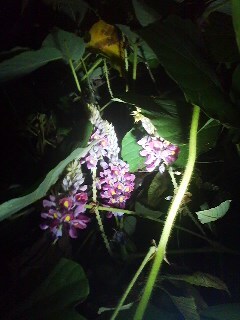 One of the special encounters during last year`s walk- the flowers of the KUDZU plant. 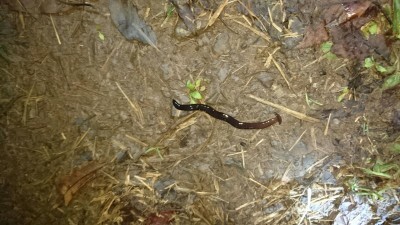 Dr. Oya has explained to me how the original soundscapes of autumn nights in Japan have been in fact completely altered by an invasive species called the AOMATSUMUSHI (青松虫) whose call drowns out nearly all other insect sounds. If you listen carefully with your window open on autumn nights, you will also almost surely be able to hear the SUZUMUSHI (bell cricket), which IS one of the classic autumn singing insects- there is even a chapter in The Tale of Genji named after this bug. It is still sold in most pet shops for those city-dwellers who would like to　have the traditional sounds of autumn in the comfort of their homes. Thanks to Eiji Oya for leading a group of about 15 nature lovers (including 4 very excited and satisfied kids) through the wild fields behind the old Sakura City Office. We were able walk for about an hour in a delicious cool, before the rains started. We heard mainly 5 types of autumn chirping insects- each identified and pointed out to us by Dr. Oya and his discriminating ears. We listend to aomatsumushi, umaoi, suzumushi,kantan,korogi and kutsuwamushi. 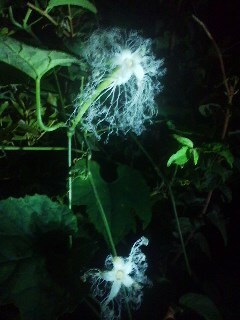 Once again this year we found some spectacular KARASU URI NO HANA fully opened like tiny suns of white lace. Just as pleasant as the insect music were the early autumn smells- and the good company. Looking forward to next month`s walk.